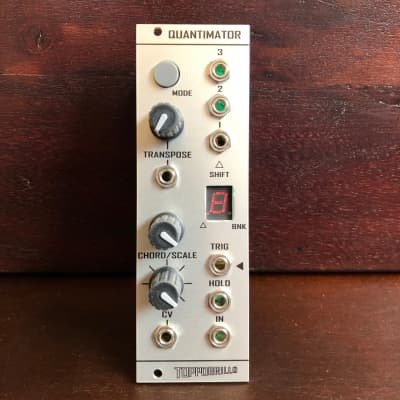 1st in a series of conceptual/electronic collaborations between Bret Truchan and Toppobrillo is a multifunctional quantizer concept designed to derive a trio of interrelated and musically useful CVs from a single control source. 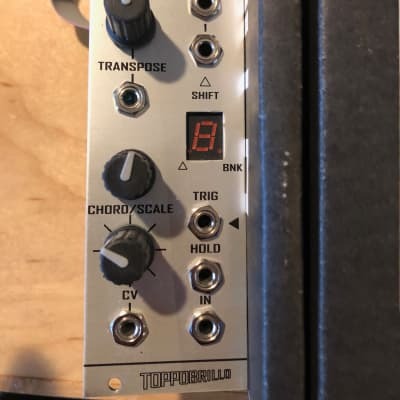 there are 2 distinct modes of operation- a CHORD mode and a SCALE mode. in chord mode a control source (sequencer, etc) is quantized to the nearest semitone value (1/12V) within a 5 octave range. 2 other control values are generated according to chord type to form a 'chord' (available at outs 2 and 3) when used with multiple 1V/OCT VCOs..the HOLD input will cause the outputs to hold their value when high- Triggers received in this state will rotate the outputs arpeggio style! there are 32 chord types available in any key. in scale mode an input is quantized according to the selected scale. values are passed down the line (Analog Shift Register style) with each trigger (1 to 2, 2 to 3..) when HOLD is initiated, no new values are acquired and the data in memory will be continually looped to the 3 outputs with each trigger. there are 32 scales available in 2 banks of 16. bank and mode are indicated in the 7-segment LEDs decimal places.